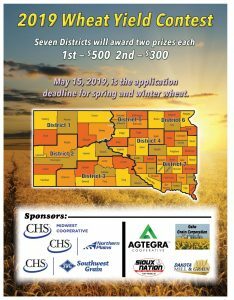 Wheat Yield Contest – South Dakota Wheat Inc.
To enter, you must be an SDWI member in good standing. A one-year membership ($100) can be included with your entry fee. The first entry is FREE. Additional entries will be $10 per entry. A farm entity or operation may enter more than one entry but each entry must have a different identifying name or letter. The state shall be divided into seven Districts (see map). The location of the field, not the entrant address, will determine the region of the entry. In each District the SDWI Director will be the contact for the District (see below). Contest field must be at least 10 continuous acres of one variety number. Continuous being defined as “not separated by public roads, permanent field roads, or waterways that are delineated out of FSA maps or other structure or features that course a field to be “farmed” separately. Out of this field, a minimum of 2.5 acres must be harvested for the “official” weight/yield. There is no maximum size for the official weight/yield. The supervisor’s names must be on the SDWI contest entry form along with their title, address, telephone and email address, before the entry can be accepted. The supervisor’s responsibility is to oversee the harvest and make the final computations of yield based on an accurate weight, moisture and calculated area. It is the responsibility of the entrant to submit the final paperwork. a. Examples of QUALIFYING SUPERVISORS would be local extension personnel, local bankers, FFA advisor, SDWI Board Members, etc.